Beauty advisor Aisha Kelly spoke to Nicola Corless about the most common make-up bag blunders and how getting good advice from an expert can save you money on your cosmetics. If the inside of your make-up bag is a clutter of worn mascara bottles, foundation stains and twice-used moisturisers, or even if you just can’t remember when you bought that coral lip gloss, then Aisha Kelly’s advice is definitely for you. 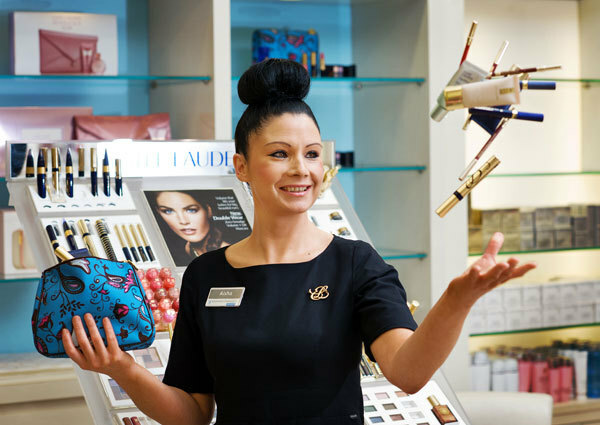 Aisha, Estée Lauder counter manager at Rochford’s Pharmacy, Parnell Street, Ennis, has twice been a winner of the prestigious Estée Lauder Beauty Advisor Award. As February gives way to March and the new season really takes hold, now is a great time to spring clean your make-up bag. As well as lightening the load you carry around with you, a little bit of organisation might even lead to better skin.“I love make-up and I love trying new things. At the moment I have three mascaras, four foundations, five glosses, four concealers, two eyeshadows, four lipliners, two primers, one skin illuminator, one loose powder, two bronzers, a bronzing brush and a face spray in my own make-up bag,” Aisha reveals. According to the beauty advisor, she knows how long she has had “most items” but she acknowledges that after spending hard-earned money on cosmetics, it is difficult to throw them away.“I find it very helpful to write on the label the date that I open each item. Every item has a certain shelf life and by noting the date, I know when they have to be discarded,” she explains.“Clare women’s attitude to their make-up bag really varies from person to person but most people tend to hoard their cosmetics. It’s always difficult to discard something, even if you rarely use it,” she admits. Women here, Aisha estimates, review the contents of their make-up bags approximately once a year but this is not often enough she believes.“I try to do a spring clean every six months. But I have to admit I keep adding new items to it in the meantime so sometimes it’s when it starts to get really full. We all really should be doing this every six months,” she continues. Even if you don’t wear make-up particularly often, the six-month rule still applies, according to Aisha.“We should be cleaning out our make-up bags for hygiene purposes. Every cosmetic, regardless of the number of times you use it, will only have a certain shelf life once it is opened. This can vary from three months to about two years, depending on the product,” she explains.“Mascaras are probably the most important to replace often. Depending on the brand, the shelf life is usually three to six months once opened. A mascara that has been in use for too long can lead to a build-up of bacteria, which can cause an eye infection. When it comes to a time to replace items, some products will be more obvious than others. For example, moisturisers will discolour, especially if exposed to sunlight. Liquid foundations tend to separate and mascara brushes tend to look dry and caked. Obviously, they should never be used if they have reached this stage,” she warns. While use-by dates should be adhered to, there are ways to maximise the shelf life of products. Unfortunately, for many women, abandoning a make-up bag in a steamy bathroom is not among Aisha’s tips.“To ensure the longevity of a product, make sure lids are tightly closed on all items, even eye pencils. They should be stored out of direct sunlight and in a cool, dry place,” she outlines.There are no strict rules when it comes to how long a product will last once opened. The use-by date varies from item to item and brand to brand.“There should be a small symbol on every product indicating how long it can be used once opened. If you can’t find this symbol on your product, you should ask your beauty advisor to find it for you,” Aisha explains. On most products, this use-by date is indicated by an outline of an open jar with a number in it or beside it followed by the letter M. The M represents months. For those who struggle to remember when they opened the item, Aisha has some very practical advice.“Writing the date of opening on your products can be really helpful. It will also let you see how much you are using. Some customers can be surprised that a more expensive product can last so much longer and can represent value in the long term,” she continued. When cleaning out your make-up bag, special attention should be paid to brushes and applicators.“It is very important to wash or replace these as necessary. Brushes, especially foundation brushes, need to be washed after every use. Using a dirty brush on the face will transfer bacteria, which could potentially lead to spots and blemishes. Brushes should ideally be washed with a branded brush cleaner. If not, wash with warm, soapy water and leave brushes to dry naturally, lying flat with the bristles left over the edge of a counter. This is to avoid pooling of water under the brush, which will lead to brush damage. Brushes should never be dried with a hairdryer,” Aisha warns.She adds, “Good quality brushes can be more expensive to purchase but if cared for properly can last a very, very long time to ensure you get full value from them”. Having cosmetics in your make-up bag that are opened, but rarely used, is a sign that the products probably don’t suit you. Nonetheless, it can still be hard to throw them out when you haven’t got any value from them. This is a common problem but one that is easily preventable, according to the Ennis-based beauty advisor.“If you buy a product that is not suitable for you, it’s likely that you will use it once or twice and then leave it in your make-up bag. Getting good advice from an expert before you purchase is the best way to avoid a build-up of unwanted products,” Aisha concludes.